Already done with usual sakkarai pongal for thai pongal at my space and nowadays am trying some ways to have hand pound rice/kaikuthal rice regularly!atleast weekly once but not as such as boiled rice but as snacks and even as desserts.The soaking time and cooking time is little longer and water needed is the triple the amount than the usual especially for pongal.There is some difference between brown rice and hand-pound rice for hand pound rice it is lightly polished and for brown rice its a full unpolished rice. A wide variety of rice are available in the market mostly inorganic and when its inorganic its cheap compared to organic rice but organic is most recommended!not at all economical which every one can buy it and make their living.Many does not like adding edible camphor even to sweet dishes but I like the taste and aroma it gives and adding jaggery depends upon ones the taste if you like to be less sweet then reduce!for this kai kuthal rice pongal jaggery should be not less and not too high.The ghee added also varies as I add little more(not too much) to have that real flavorful pongal. 1.Before soaking wash both dal and rice very well. 2.Soak dhal separately for 1/2 hour and the rice 6-7 hours. 4.Boil 4 cups of water when it boils add rice dal mixture and pressure cook. 5.In between boil jaggery with little sprinkles of water. 6.when it dissolves filter add elachi powder,dry ginger and edible camphor mix and keep ready. 7.Now after pressure is released mash well add this jaggery syrup. 8.Stir in for some time till all combined and cooked. 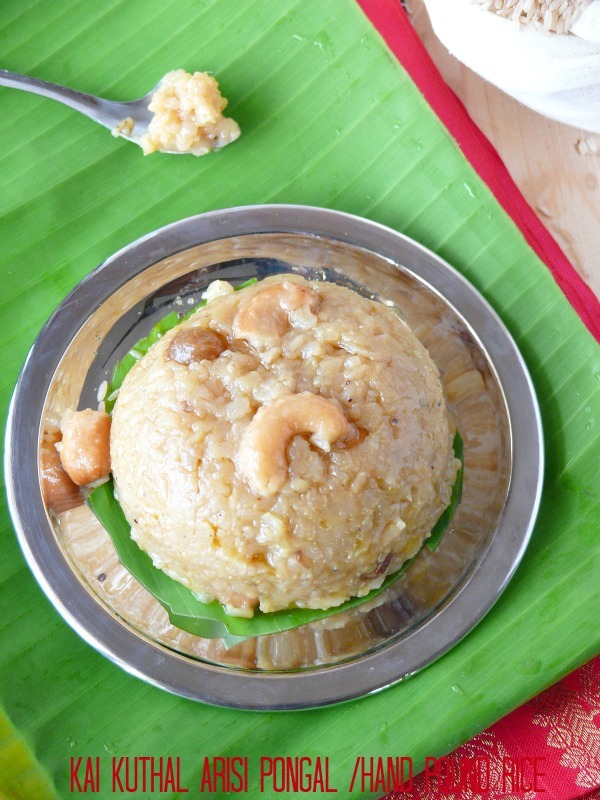 9.Add ghee in a kadai add cashews and kismis and add to this pongal and serve. Before soaking wash both dal and rice very well. Soak dhal seperately for 1/2 hour and the rice 6-7 hours. Boil 4 cups of water when it boils add rice dal mixture and pressure cook. Inbetween boil jaggery with little sprinkles of water. when it dissolves filter add elachi powder,dry ginger and edible camphor mix and keep ready. Now after pressure is released mash well add this jaggery syrup. Stir in for some time till all combined and cooked. 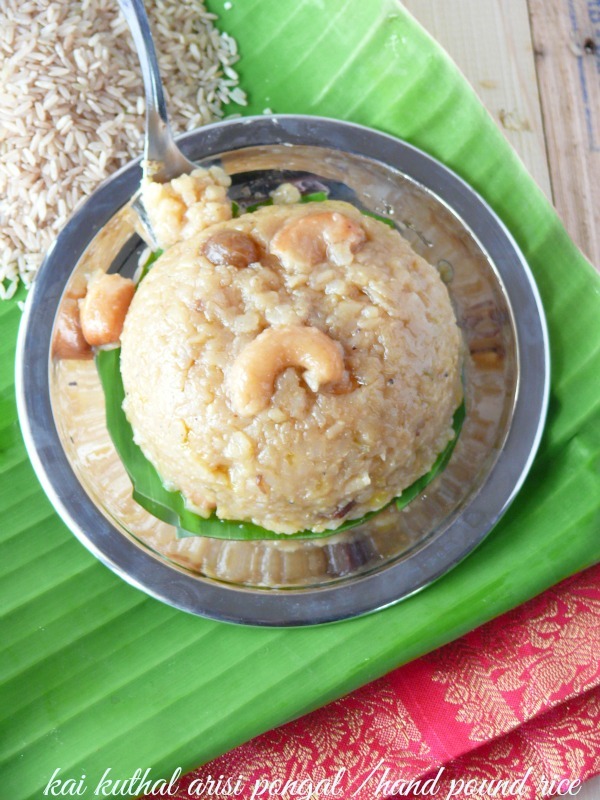 Add ghee in a kadai add cashews and kismis and add to this pongal and serve. Sometimes even some more water may be needed according to rice quality. 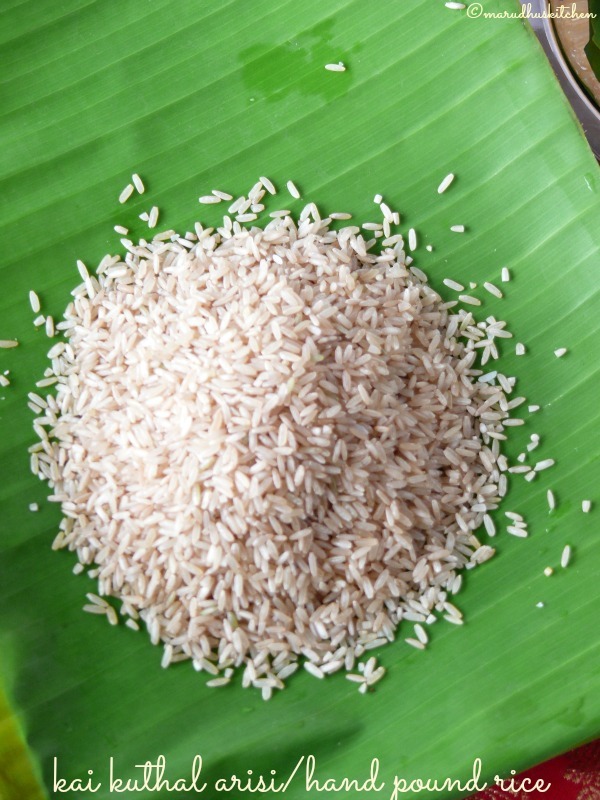 Soaking rice is more important which makes the rice to cook quick and soft. Adding camphor is optional but it gives nice lift to this pongal. A wonderful insight into the goodness and attributes of hand pounded rice makes for a very informative read. The dish is earthy and extremely aromatic. The edible camphor, along with the dry ginger powder and ghee would create a power packed fragrant dish. Thank you for such a decant dish on such an auspicious occassion. Wishing a very Happy Pongal to you and your beautiful family. Never tried kai kuthal arisi.Is it More nutritious than regular boiled rice? I can be sure it must taste delicious than regular rice. Happy Pongal.. wow kaikuthal arisi. where did you get it pa?